Beautiful quilt set. Very good quality. 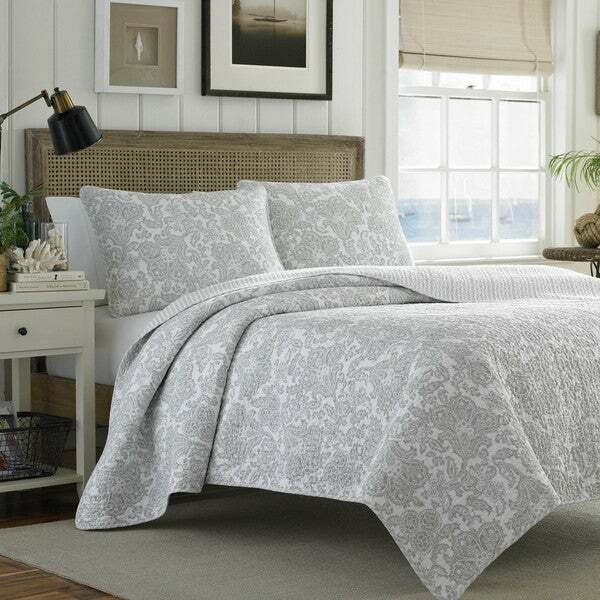 Breathe laidback, effortless energy into your bedroom with this Tommy Bahama cotton quilt set. This fully reversible quilt is crafted using 100-percent cotton with a lovely grey floral pattern. This quilt is the perfect finishing touch. Well-made, nice light weight, attractive patterns, and good colors. You always wonder what the item will really look like and will it differ from the photos. This quilt did not disappoint, if you want a soft white and neutral gray--my bedroom colors as it happens--this is just right. The grey in the pattern plays well with other greys and the whole effect makes the room "pop". I was a little skeptical about getting this quilt because it looks more white then grey but I was wrong, it definitely has a good balance. I was concerned because of my dog but I haven't had any issues. I love it - the pattern is very elegant. It fits well on a queen but is a little snug. With regards to warmth and quality, I am usually a cold person to begin with an have found that most nights I am a little too warm. It is also very soft. Definitely recommend. Great quality! Just to short for my king bed. Although it is very good quality, it's a little short of a good fit. If you dry this it will shrink even shorter. Love this quilt. I use my king size now for a queen size bed. Love it! Too bad I can't get the size bigger to fit my King size bed. The Quilt Set is beautiful, the dimensions are just right for my queen bed; and I love the look and feel of the set. I like sleeping under quilts even in the summer and this one is beautiful. The underside compliments the pattern; and reminds me of quilts made by my grandmother. Love it! I ordered this set for a spare room and really love how it looks. The quilt is thin, but perfect for the weather in California. It's soft and the quality is very good. I am happy I bought it. Love this quilt set. The color is a perfect neutral gray - no undertones of blue, green, beige. The weight makes it a great transitional quilt - great for spring, summer, fall sleeping and still great with a blanket for winter. The quilt is well made and sized. Love that it can be reversed for a different pattern. I switch based on the pattern of my sheets. 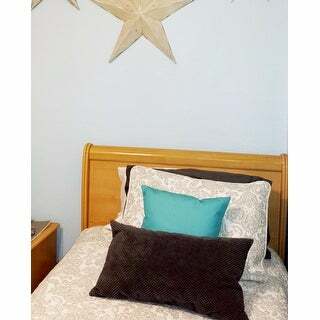 I researched different quilts both here and other sites/stores to find what I wanted: thin but not flimsy with just enough pattern and I took a chance on this tommy Bahamas based on reviews. So glad I did. I washed both the quilt and shams and my bed now looks gorgeous. What a difference bedding can make to a bedroom. I also bought a new bed skirt that is white with a silver embroidery near the bottom which thankfully matches. Together it looks great! I have a queen size bed and read some of the reviews that said the queen seemed a little small, so I purchased the King size. I'm so happy with the King size, it fits lovely on my bed and is so pretty. Great quality. I will be purchasing a lot more from Overstock.com. Standard shipping was fast and packaged nicely as well. This quilt is very nice. It looks just like the pics online, is very comfortable and light. This quilt is lovely and works well for my purpose. I suspected it might shrink significantly in the laundry, and it did. Glad I purchased a King to use on a Queen-sized bed! I love this quilt. It is a beautiful pattern and design. It is light but still keeps me warm with my fan and AC going. Very modern and makes my room look very pretty! I bought this for myself, but my daughter has it on her bed. It's beautiful and she fell in love with the unique design and subtle texture it can bring to a room. The light gray still provided a perfect neutral color, yet you won't see this quilt everyday. It definitely has substance. It is not a lightweight quilt, but it is soft. This quilt is so perfect. It is SOOOOO cute and comfortable. It's not too light or too heavy. I have gotten so many compliments on it. I would certainly recommend it. Love the weight, not too heavy but still substantial. Reverse side very attractive. Buying another! Product on time and in great condition. Color matched expectations. Good fit for the room. Bought two Queen size. Thickness and feel is great. Nice quilt but wasn’t what I wanted. Had to send it back. This is a beautiful quilt. Although it is thinner than a standard bed quilt I love the look of this quality product. Very contemporary and stylish it goes well in my newly redecorated bedroom. I love this quilt ! It's nice and light and very stylish! I highly recommend this quilt for the price and quality. I would definitely purchase this again! Love the simplicity of the design. It looks beautiful on my bed. Well made no complaints yet. I love this quilt. I purchased this in a king size it was great fit. then I purchased it in a queen. NO NO does not fit too short all around. Very disappointed. "What are the measurements of the King size quilt?" The king quilt measures approximately 96 inches wide x 104 inches long. "The description shows for king size quilt 96 wide by 104 long. Is his the correct measurements? makes more sense to be 104 wide by 96 long." The pattern will fit either way, so it goes to matter. "Are the King shams for king sized pillows?" "When will king be back in stock? Is there a way you can notify me?" We hope to restock the king if it become availalbe again. Unfortunately, we are unable to send notifications for individual colors. Please check back with us periodically. "Is the white a bright white or more of an off white / ivory?" It has been described as a soft grey and white tone. This set is soooo beautiful!!! Yes it is white and a soft feather grey and stunning. I ordered a queen for my king because I Love a layered look and it drapes perfectly!! I'm considering buying 2 more for my family room because the quilting is so pretty! "Is there a bed skirt that would match the colors in this quilt?" Hello Cubbiegirl, we offer a great selection of bed-skirts that would compliment this set well. Thank you for shopping with us. Hello medfordmom, unfortunately the shams are not sold seperately from our inventory. Please let us know if you have additional questions. Thanks for shopping with us.